We are a team of doctors, nurses, scientists and researchers based at the Wellcome Trust-MRC Institute of Metabolic Science (IMS) in Cambridge, where we study weight problems. Our aim is to undertake world-leading research that will improve understanding of the causes and consequences of obesity and bring forward advances in science to improve patient care. For the last 20 years, our team, led by Professor Sadaf Farooqi, has been studying the genetic basis of obesity. As part of this work, we have identified potential drug targets, some of which are moving forward in clinical trials. However, obesity is a complex issue. There are many reasons why people gain weight and we may need multiple strategies to help them. We are continually trying to find new ways to think about finding treatments for obesity. One question we have been working to address over the last few years is whether we can understand more about obesity by studying thinness. We are interested in understanding why some people gain weight more easily than others. Whilst it is well known that changes in our environment such as easy access to high calorie foods and sedentary lifestyles have driven the rise in obesity, there is considerable individual variation in weight within a population that shares the same environment. Studies of twins have shown that this variation in body weight is largely genetically determined. We can therefore use genetic approaches to understand the mechanisms involved in weight regulation which will ultimately inform the development of more focussed preventative and therapeutic strategies. 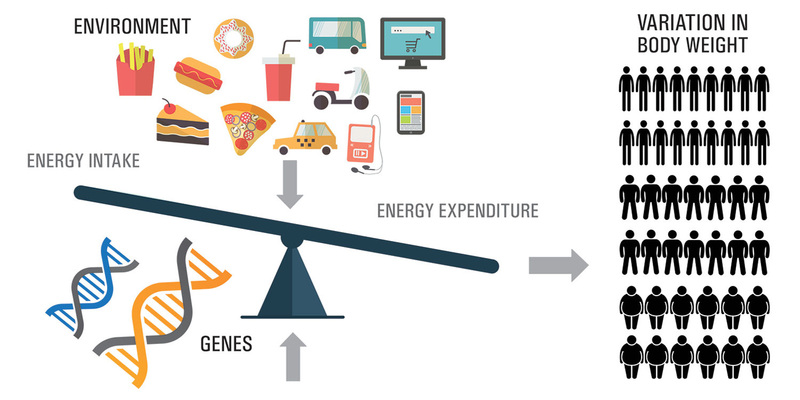 Our previous work has been on obesity, where by studying people who gained a lot of weight from a young age, we have identified 15 genes that are key to controlling weight (www.goos.org.uk). Some of these discoveries have led to new treatments. Another way of thinking about potential treatments is to find genes that might protect some people from gaining weight. With this aim in mind, we have established a new study called STILTS (Study Into Lean and Thin Subjects). Our aim is to study people who are healthy and thin to find the genes that might protect them from gaining weight or that might allow them to burn extra calories easily. Finding the genes for thinness could pave the way for new treatments for obesity and indeed help people with a range of weight problems. This study was made possible by a large grant we were awarded by the European Research Council (ERC). The ability to recruit through GPs, a strength of the unified healthcare system (NHS) in the UK, critically with the involvement of the NIHR Primary Care Research Network has been instrumental in our ability to identify suitable people who are thin (defined as a body mass index, BMI of 18 kg/m2) and well. People were identified by database searches in individual GP practices based on BMI, age and absence of any chronic medical condition. After receiving an invitation letter, those who consented to take part, completed a questionnaire including a detailed medical history and provided a DNA sample. Interestingly, 74% of the STILTS cohort have a strong family history of thinness which gives additional confidence that we have enriched for the highly heritable phenotype of persistent thinness. In collaboration with Ines Barroso at the Wellcome Trust Sanger Institute, we have performed an initial genetic study of common and rare variants using an exome array. 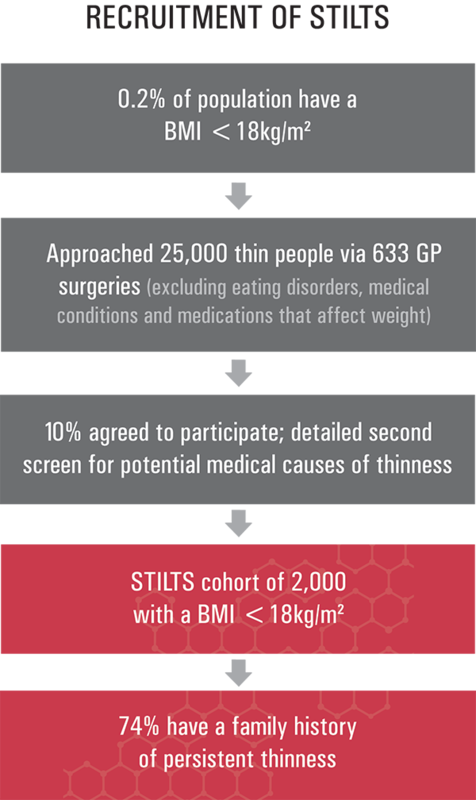 We have compared the data from the STILTS cohort with a comparable number of severely obese people and over 10,000 normal weight controls. We have some exciting preliminary data which is being prepared for publication and which we will make available here as soon as the paper is published. We have discovered new genetic regions involved in severe obesity and some involved in healthy thinness. When we add up the contribution of different genetic variants to calculate a genetic risk score, we find that obese people have a higher score than normal weight people, which contributes to their risk of being overweight. For the first time, we show that thin people, have a much lower genetic risk score – they have fewer genetic variants that we know can increase a person’s chances of being overweight. In parallel, we have been seeking consent to undertake whole exome sequencing. This will allow us to find very rare genetic variants which often exert a stronger effect. We are delighted that a large proportion of the people who originally agreed to take part in STILTS, have agreed to take part in this next more advanced study. We already know that people can be thin for different reasons. Some people are not that interested in food whereas others can eat what they like, but never put on weight. If we can find the genes that prevent those people from putting on weight, we may be able to target those genes to find new weight loss strategies.